08/Dec/2015 Posted By admin no comments. 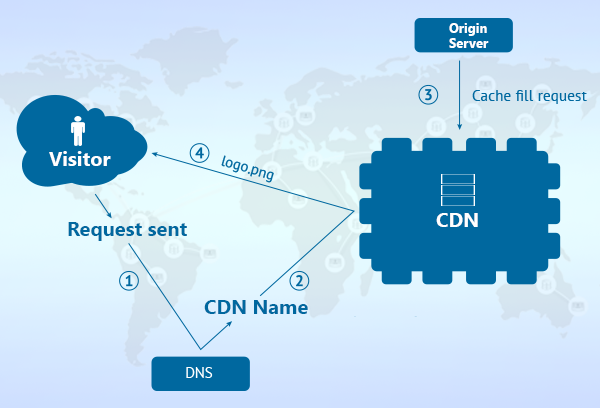 A Content Delivery Network (CDN) is an interconnected system of computers on the internet that provides web content rapidly to numerous users by duplicating or caching the content on multiple servers and directing the content to users on proximity. The goal of a CDN is to serve content to end-users with high availability and high performance. CDNs serve a large fraction of the Internet content today, including web objects (text, graphics, and scripts), downloadable objects (media files, software, documents), applications (e-commerce, portals), real-time streaming data, on-demand streaming media, and social networks. When an end-user requests a specific web page, video or file, the server closest to that user is dynamically determined and is used to deliver the content to that user, thereby increasing the speed of delivery. Content may be replicated on hundreds or thousands of servers in order to provide identical content to as many users as possible even during peak usage. Companies which are in media, entertainment, gaming, software, online retail and many more which have digital rich content on their website and want to deliver the same to their audience quickly and reliably can use CDN. Consumers want a high-quality online experience whether they are watching a movie, streaming an event, playing a game or shopping online. Using CDNs results in an increase of performance, thus giving the end users an enhanced consumer experience. The Worldwide market for content delivery network services is estimated to reach nearly US $6.9 billion in 2017. As a result of, strategically placed servers which form the backbone of the network the companies can have an increase in capacity and number of concurrent users that they can handle. Essentially, the content is spread out across several servers, as opposed to offloading them onto one large server. Due to higher reliability, operators can deliver high-quality content with a high level of service, low network server loads, and thus, lower costs. Moreover, jQuery is ubiquitous on the web. There’s a high probability that someone visiting a particular page has already done that in the past using the Google CDN. Therefore, the file has already been cached by the browser and the user won’t need to download again. CDNs can deliver different content to different users depending on the kind of device requesting the content. They are capable of detecting the type of mobile devices and can deliver a device-specific version of the content. End users experience less jitter and improved stream quality. CDN users can, therefore, deliver high definition content with high Quality of Service, low costs, and low network load. CDNs dynamically distribute assets to the strategically placed core, fallback, and edge servers. CDNs can give more control of asset delivery and network load. They can optimize capacity per customer, provide views of real-time load and statistics, reveal which assets are popular, show active regions and report exact viewing details to customers. CDNs can thus offer 100% availability, even with large power, network or hardware outages. CDNs offer secure storage capacity for content such as videos for enterprises that need it, as well as archiving and enhanced data backup services. CDNs can secure content through Digital Rights Management and limit access through user authentication.